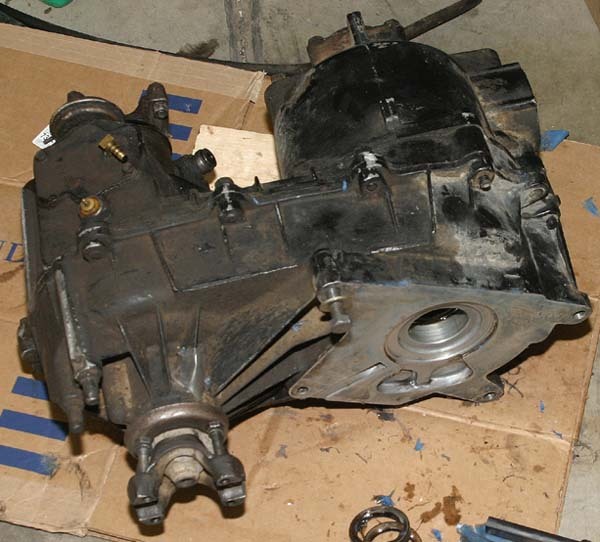 Removal, disassembly, assembly and re-installation of a Quadra-Trac transfer case in an SJ series truck. Here's what I encountered as I removed my Quadra-Trac (QT) transfer case to fix the transmission input seal. 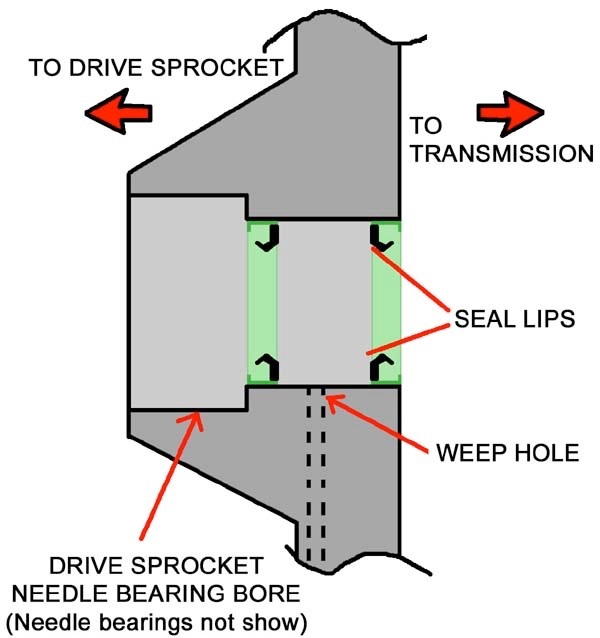 Note that disassembly of the transfer case is NOT required to replace the transmission input seal, actually called the (transmission) output shaft seal in the TSM (Technical Service Manual). Since my QT unit had been bathed in a mixture of QT fluid and Dexron (transmission fluid) due to the failed seals, I decided to tear it down and clean out the insides. you how I did it. With that out of the way, let's get started. well. 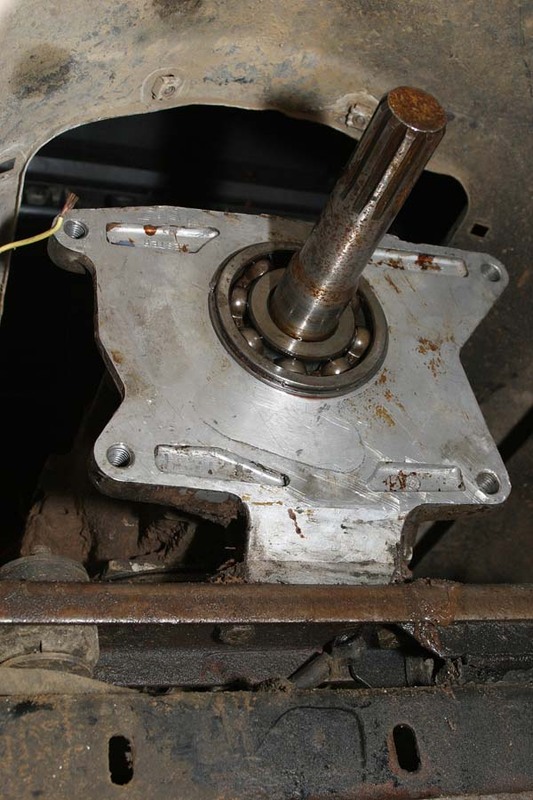 Since the drive shafts will be removed, the transmission parking pawl will obviously have no effect. closest to the seats as I slid the cover towards the rear of the vehicle. two were easily removed from underneath the truck. cross member. That's where the transmission access cover comes in handy. I removed the bolts from the top. E-Drive switch wire, the speedometer wire and the vent hose. the reduction unit bolts to drain the oil from the reduction unit. With the four transmission to transfer case bolts loosened, I carefully pried the two apart just ever so slightly. head. This is why I left two bolts threaded in. In case the case (sorry) moved too far, the bolts would stop it. 6 inches! 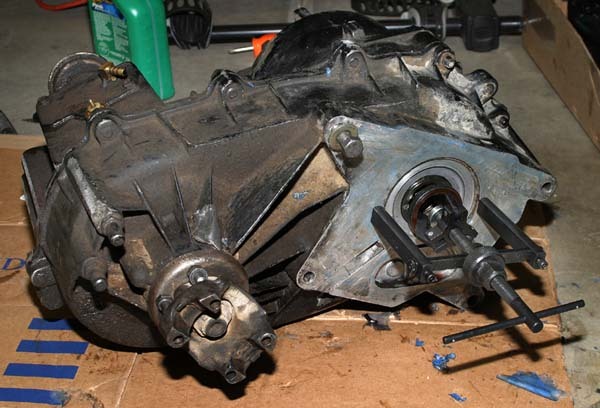 With the transfer case now completely free, I lifted it off my chest and set it down on the ground. remaining part is much easier to handle. convenient the access to those bolts is. line is tapped into the access cover for the E-Drive shift mechanism. rings, gouged parts and pinched fingers. I placed the case on a table with the transmission side facing down. This case does not have a reduction unit so it has a cover instead. Still attached to the case is the differential (on the right), chain and drive sprocket (on the left). sprocket side of the assembly. It is plastic and rather stiff. I doubt it would handle much flexing. I set it safely aside for re-assembly later. Next, I flipped over the case assembly to lift the case off of the chain/sprocket/-differential assembly. bolts that hold the access cover on. prevents the assembly from coming out. screwdriver to pry them up. A magnet is handy here to make sure they don't go flying. Now it was time to pull the shift rod out. There is another hole on the opposite end that is seemingly empty. The screwdriver is pointing to the hole that contains the spring-loaded ball bearing. and I could feel it as I pulled the shift rod out. fork. I put all the E-Drive related parts in a small plastic container so they wouldn't get lost. makes a big deal about match-marking the differential to make sure the ends get stuck back on the same end. under any sort of pressure from the springs, so don't worry about it flying off. The sludge is even all over the bolts! Yuck! washer on the bottom of the "spring" pack. Now I simply removed the rest of the components as they presented themselves. The sides of the friction cone are rather rough and may have sharp burrs. Mine did. TSM says it's OK to drive the pin out if you need to. doesn't say to. The differential was ready to be re-installed. I previously removed the E-Drive shift fork and re-installed it after I set the gear/chain assembly in the case. back out. Don't do what I did. Re-install the shift fork assembly before installing the gear/chain assembly. shift collar. The shift fork should have the long part towards the rear of the case. top of the bearing. I removed the screwdriver and slid the shift rod the rest of the way in. I re-installed the locking spring that keeps the shift motor in place. Slide the fork towards the vacuum motor. This will aid in case re-assembly. After fitting the new gasket into the groove, I replaced the access panel. the gears were level. I wrapped the chain around the gears and spread the gears apart to take up chain slack. I carefully flipped the assembly over and rested the flat transmission mating surface on a 2x4 block of wood. I slid the rubber case seal into the groove on the cover next. to secure the washer to the cover while you install the cover. turn that gear, I removed the PTO cover. gasket with my seal kit, so I re-sealed it with gasket sealer. 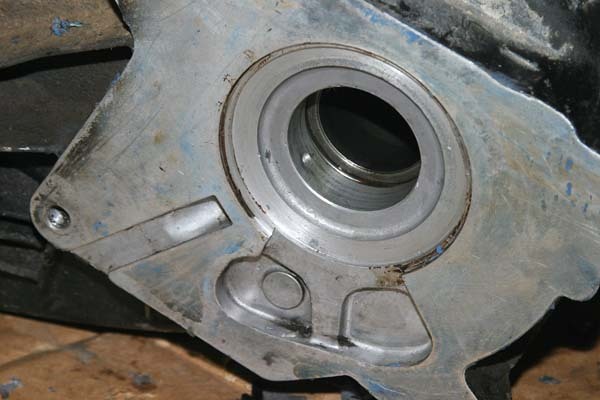 If you do not have a reduction unit, you will have an output shaft coupler. The sprocket gear protrudes like this. Place the output shaft gear on top of the drive sprocket. Line up the gears. Note the snap ring groove in the sprocket drive gear. with the sprocket gear. The snap ring should set into the groove. Install the cover now to protect the assembly. Oh, the whole reason for this was to replace the front shaft seals! That's right! come out rather effortlessly, so it was not an issue. 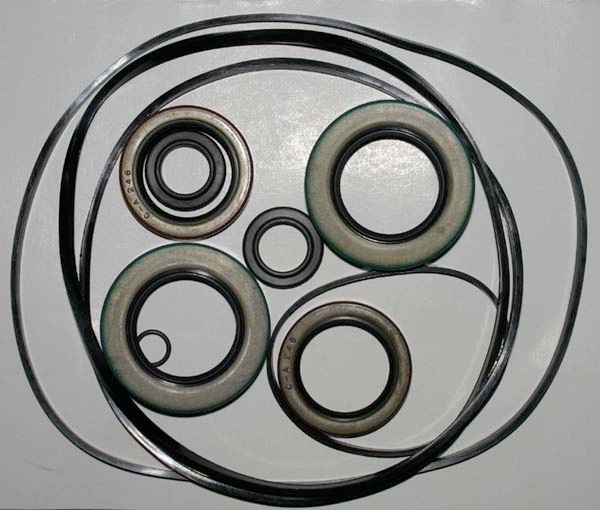 You can see the faint lines indicating where the bearings should go. Notice the weep hole in the middle of the two seals. If you seal up your QT with too much sealer, this can happen. Oops. Use a drill bit to push out the old sealant so the weep hole is clean. The weep hole allows for inspection and verification of the seals' integrity without removing the transfer case. transmission side seal has failed. go. Besides, it was rather obvious. They go on both sides of the weep hole, and don't block the weep hole. Duh. I found out in the end that they sit flush with the outer surfaces. about breaking it, buy two of them, one for each seal. fluid side. That's not real helpful in my opinion, as it's hard to tell which way the seal lips are pointing. other side, but I didn't try it. It might not work, as there is a needle bearing cup on that side. With the case put back together, it was time to re-attach the case to the transmission. drive shafts, E-drive switch wire, speedometer cable, vacuum lines and low range lever. require too much twisting to get to. either a funnel with a hose on the end or a squeeze bottle of sorts. I used a squeeze bottle. Now my QT is reconditioned and ready to hit the trails. but included, is the tranmission/transfer case mating gasket. Note that I did not replace the pinion seals, as the case wasn't leaking there. for not diving in and repairing your transfer case. Take me back to the Big Scary Jeep homepage! 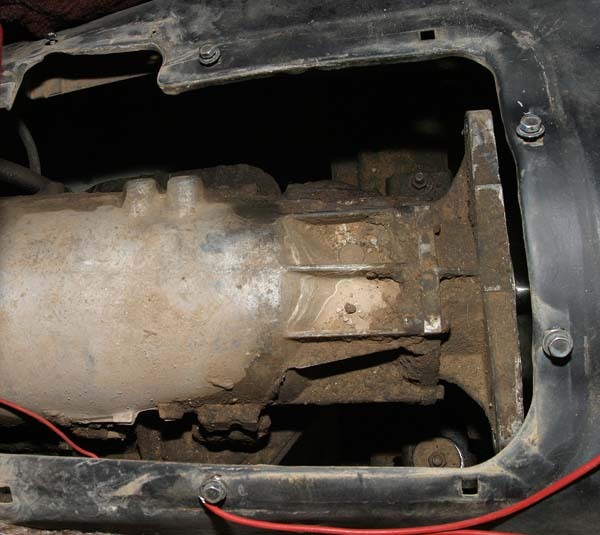 Quadra-Trac transfer case in an SJ series truck.